I was beginning to think I was never going to finish this top. 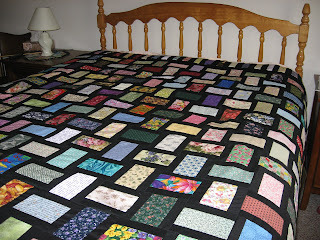 It's the Nickel Brick Quilt from the Loose Change book. 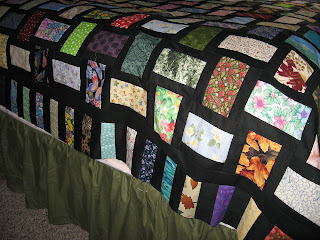 If you think a piece of fabric looks like some of yours, maybe it was from a nickel block swap at guild. Now to go a good pressing and go over front and back with the lint roller. Those lint rollers are the handiest items for cleaning off your table, self or quilt top. I'm going to take that black thread out of the machine and put the black fabric away....but not to far as I need to cut binding. This one is going out to be quilted. Now to go to Campfire Girls today at Jeanie's up in Lisle.